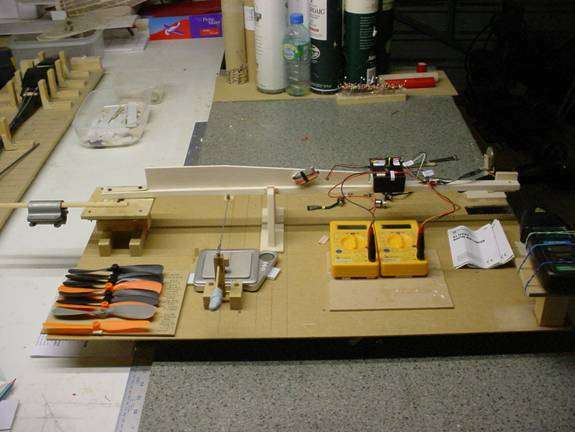 Test various brushless motors in a horizontal swinging arm thrust rig to determine the current draw for peak efficiency using thrust/Watt as a measure of system efficiency. 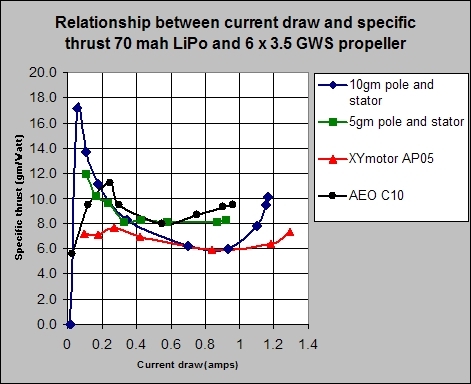 The graphic shows a simple horizontal arm thrust rig instrumented for thrust via a gramme scale, current draw, battery voltage and laser tachometer for propeller speed. A Micron servo tester provided the drive signal into a RB 3a 1s ESC. A 70mah LiPo was used to power the motor. 1. Brushless 10gm pole and stator 12.2 gm kv 2000 rev/min/volt. Using the servo tester to modulate the drive signal, current , voltage , prop speed and thrust were recorded for 6-8 current draws to cover the anticipated motor running range of a 2010 E30. Data were plotted as thrust per unit Watt (an efficiency measure) vs current draw. Only the first four motors would run on the rig. Motors 5,6 loaded the battery to less than 3v and software shut the motor down. The cheap 5gm outrunner and the more expensive AEO C10 are the motors offering the best efficiency in the 600-1000ma current draw range. This is assumed to be the power required to fly an E30. Both the C10 and 5gm motors exhibit a characteristic which is commendably flat over the anticipated 600-1000ma current draw range. This a trade off between increasing friction via windage, electromagnetic losses , bearing losses and improving propeller efficiency. The current draw for zero speed (I0) for the 5gm motor was found to be about 20ma. This compares very favourably with the I0 of a GWS brushed 12mm can motor in a 5.8:1 box of 150ma. This must reflect the friction inherent in the brushes. 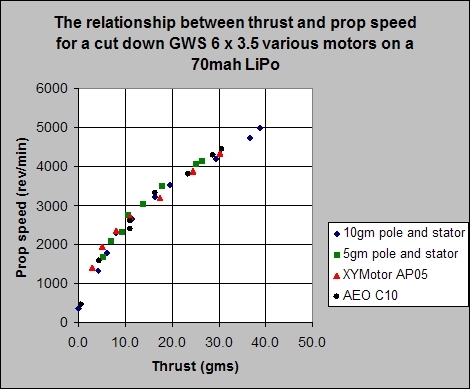 The accuracy of the data was tested by plotting thrust vs prop speed for the 4 motors as below. This should be a unique curve with variations being experimental accuracy. 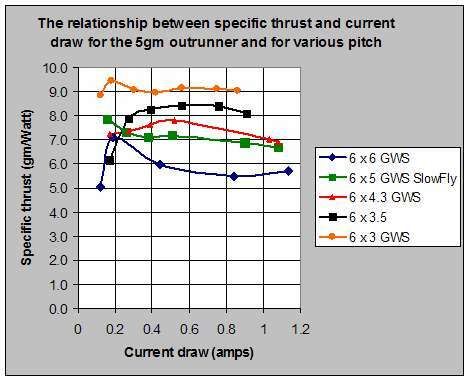 By inspection, at 25 gm thrust the thrust variability is around + or - 2gm (+ or - 8%). Not spectacular but adequate for the task in hand. This is an almost perfectly aligned preference for as low a pitch as possible. 2277 rev/min for 1.13 amps on a 6 x 6 or 4539 rev/min for .86 amps on a 6 x 3. It is self evident that a new motor and battery type for 2010 competition requires a different prop choice. The high pitch solutions of the GWS 12mm / Maxon brushed power units are not appropriate to the 5gm brushless options. The 5gm pole and stator is not a bad choice for an E30 motor. Spending a load more money on an XYMotors AP05 brings no reward but an AEO C10 may have advantage at higher current draw. The effect of pitch (if you believe in static rigs ??) is that which maximises propeller speed and argues for a low pitch of 6 x 3. 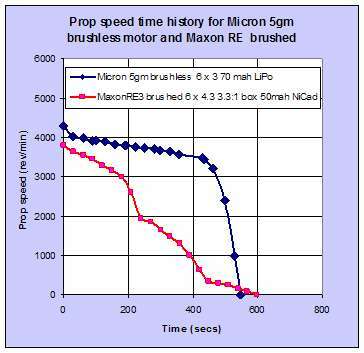 ..the Maxon data comes from a Trevor Grey test using 50 mah Sanyo's. The brushless data comes from my rig. I should run a Maxon on a 70 mah Lipo but I have not got one and at £65 not likely to . useful motor run of 420s (7min). This should set the cat amongst the pigeons.